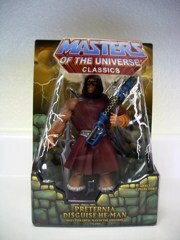 The very concept of Preternia Disguise He-Man should probably give you an immediate reaction: either it's too stupid for words or too awesome to comprehend. 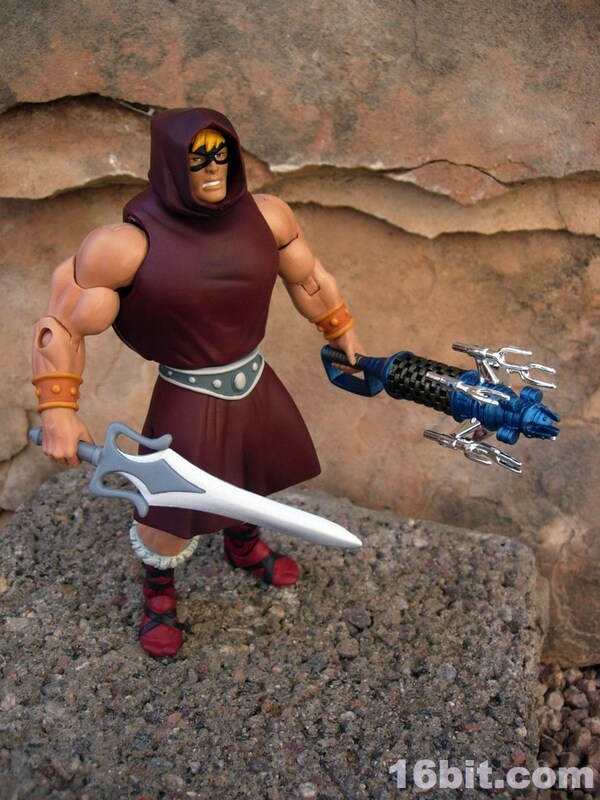 This outfit was shown in one of the last mini-comics in the original Masters of the Universe line and also appears in the new Dark Horse Mini-Comics coming with certain figures (specifically Thunder Punch He-Man) this year. 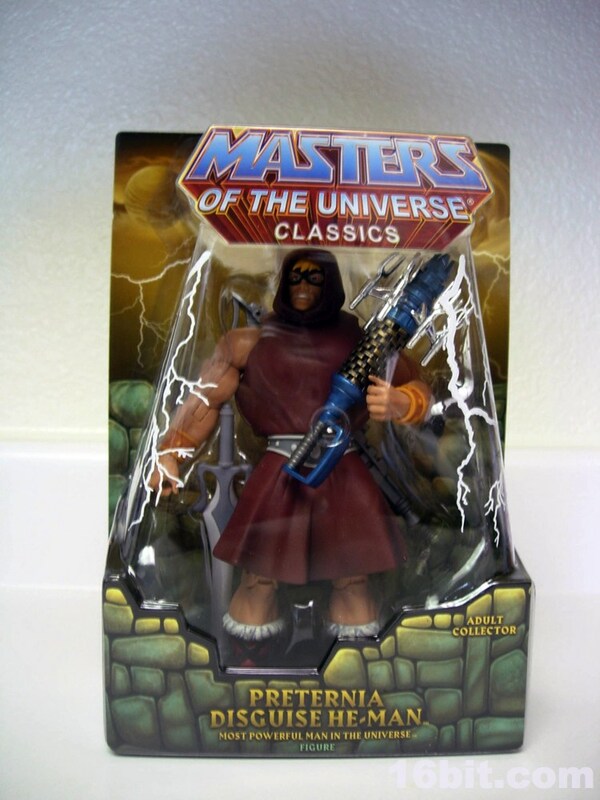 In it, He-Man goes back 5,000 years to fight numerous evil forces, rides around on a Bionatops, and wears what appears to be a Zorro mask as a potato sack. As a long-time fan of Star Wars, I like it when you take an existing character and give it a totally new costume-- so this and Battleground Teela are particularly exciting in that they offer something different. 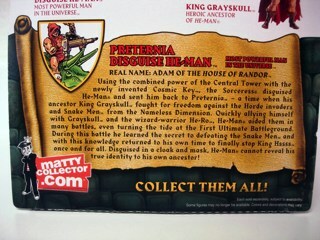 One of the great things about this figure is that it connects, in terms of story, with a lot of other random figures. 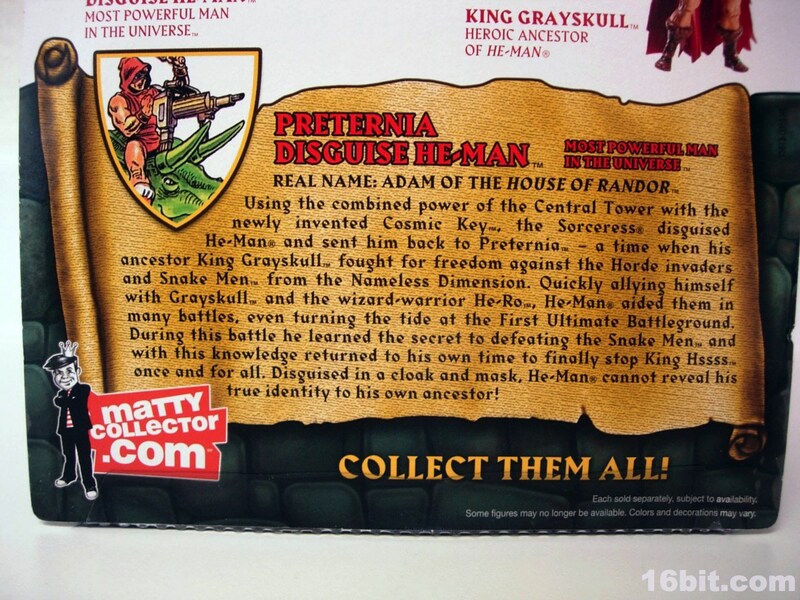 Being a time-traveller, he connects with King Hssss, He-Ro, King Grayskull, and other characters which haven't even come out yet. 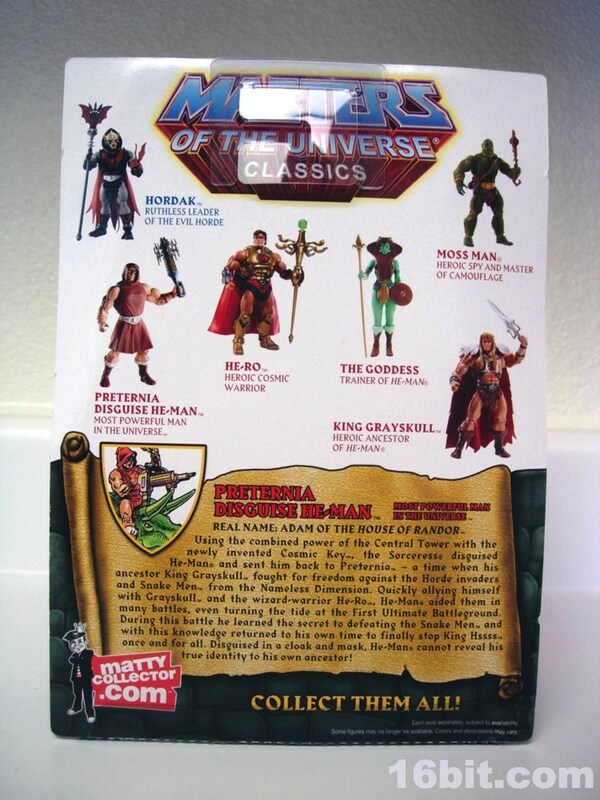 The packaging shows off a Bionatops (which is not yet scheduled for the line, nor rumored) and the Cosmic Key may imply the involvement of Gwildor. 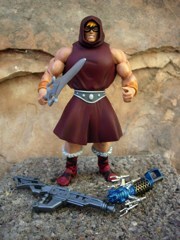 So while arguably not essential, it is a swell He-Man figure designed to go on the shelf with some of your other figures. The paint job on this figure is good, but nothing too fancy. 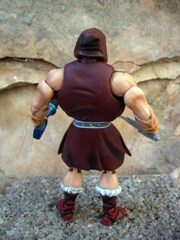 His torso is brown, and has the smooth belly button-free lower torso seen on some figures like Battle Armor He-Man (and sadly absent from figures like He-Ro.) 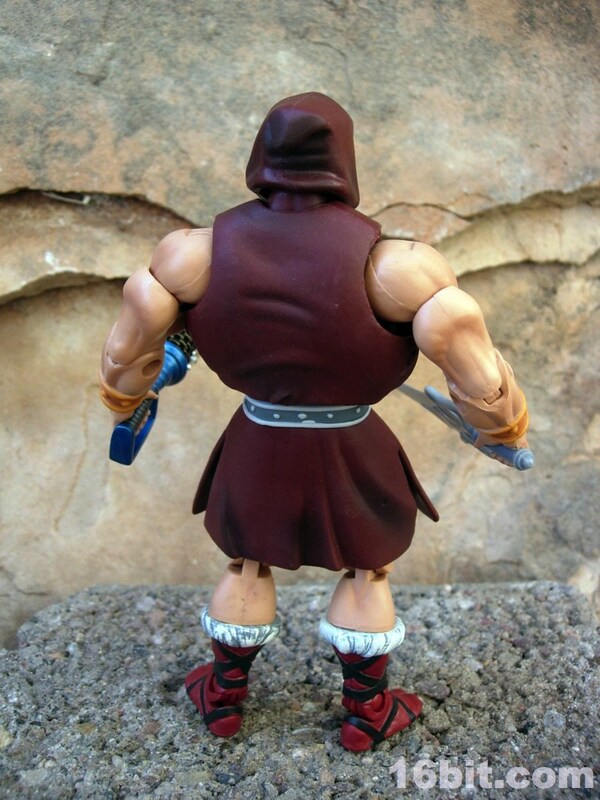 The brown "disguise" has some dark brown markings on it to add definition, which is the kind of small, reasonably cheap detail you can add to a figure to bump it up from a mere plaything to a creation that looks like it stepped out of a fantasy painting. 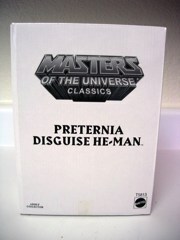 It really makes all the difference. 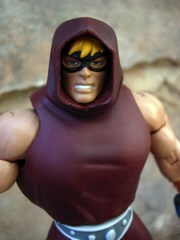 He-Man's face is painted flesh color, and his eyes and teeth are pretty dang white when juxtaposed with his black mask. 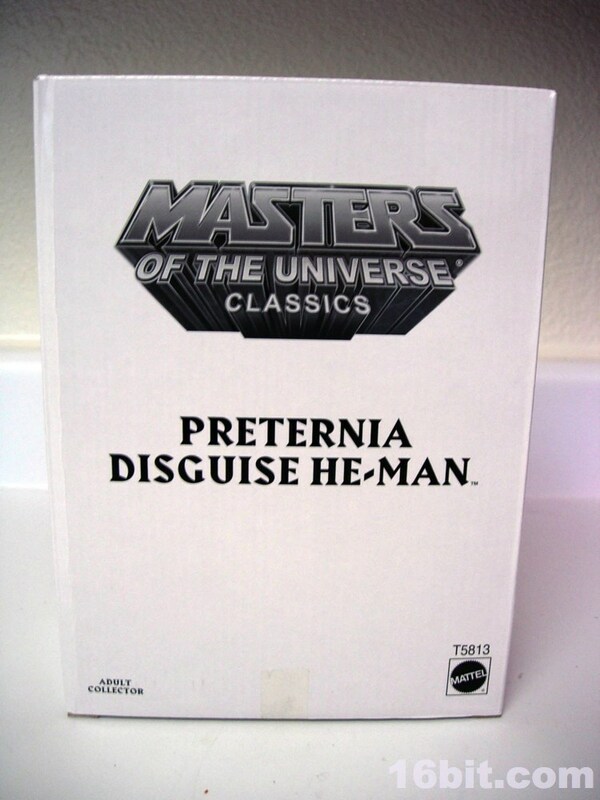 The whole idea of He-Man needing a disguise for when he time travels is pretty odd to me, as I assume nobody would really recognize him unless the sorcerers of that day could see into the future, but I digress. 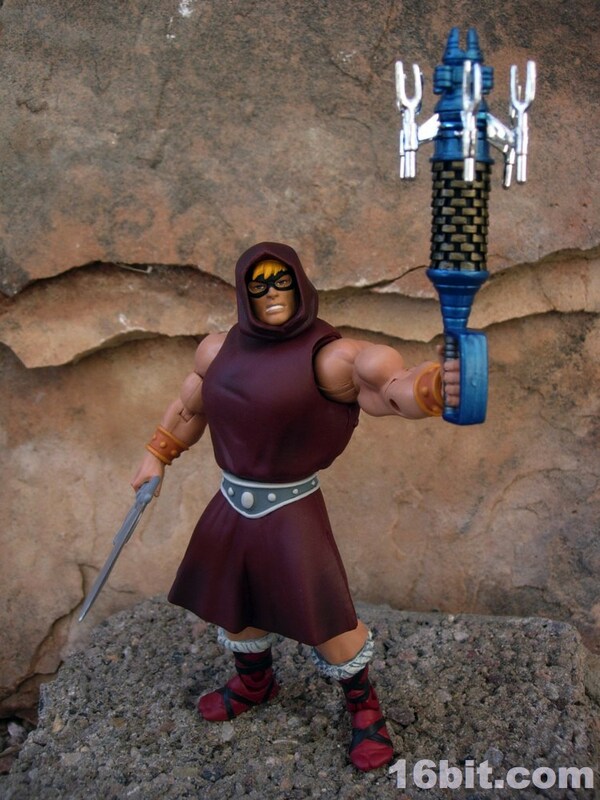 He-Man also sports the "bracelets" on both wrists like Tri-Klops and the Toys "R" US DCUC vs. MOTUC He-Man, which is a different mold than on the standard releases of the various He-Man figures. 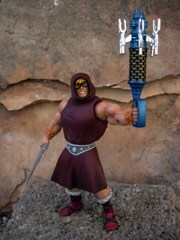 While it's a nice figure, it's the accessories that really make it exciting. 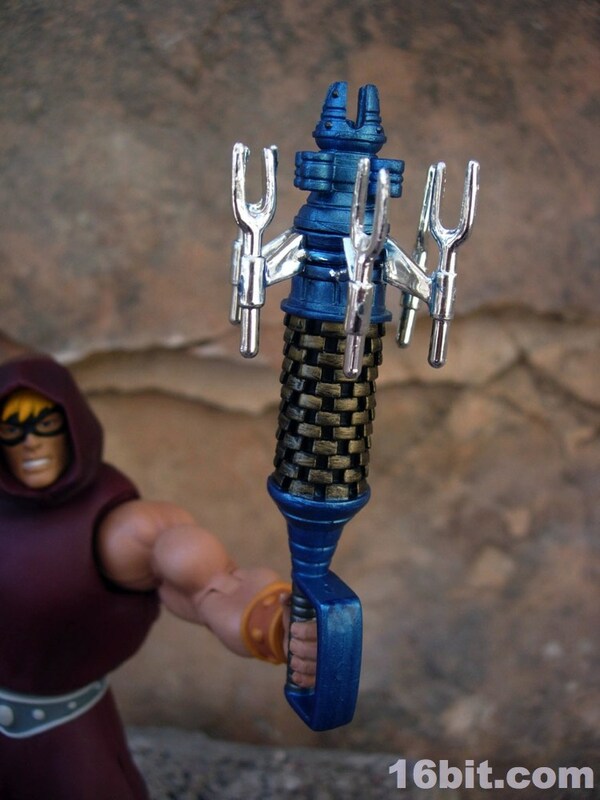 The Cosmic Key has shiny silver forks which spin around the accessory, which is inspired by a couple of vintage 1980s toys and, of course, the Masters of the Universe movie. 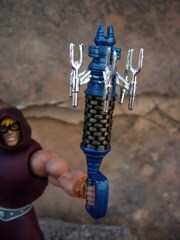 There are gold and black painted bits, while the entire accessory is a sort of metallic blue color. 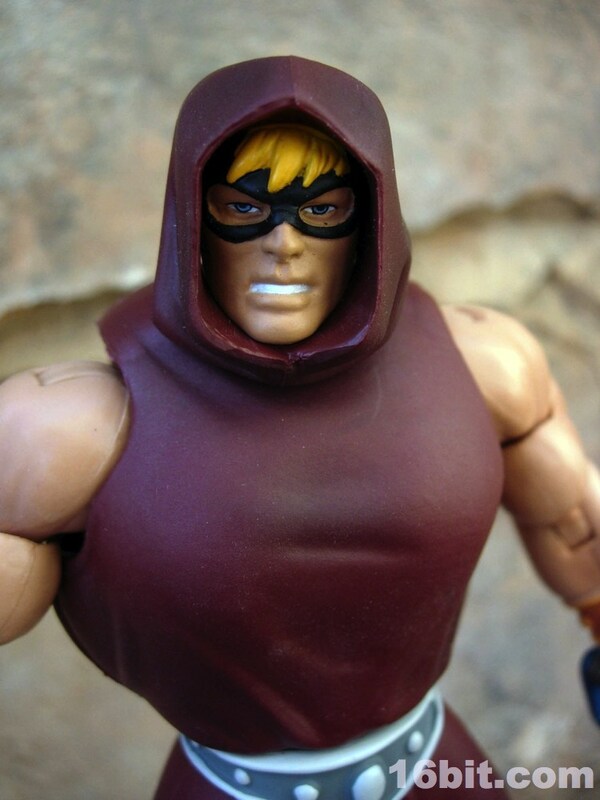 It's striking. Meanwhile, the Bionatops Blaster is just freaking huge. 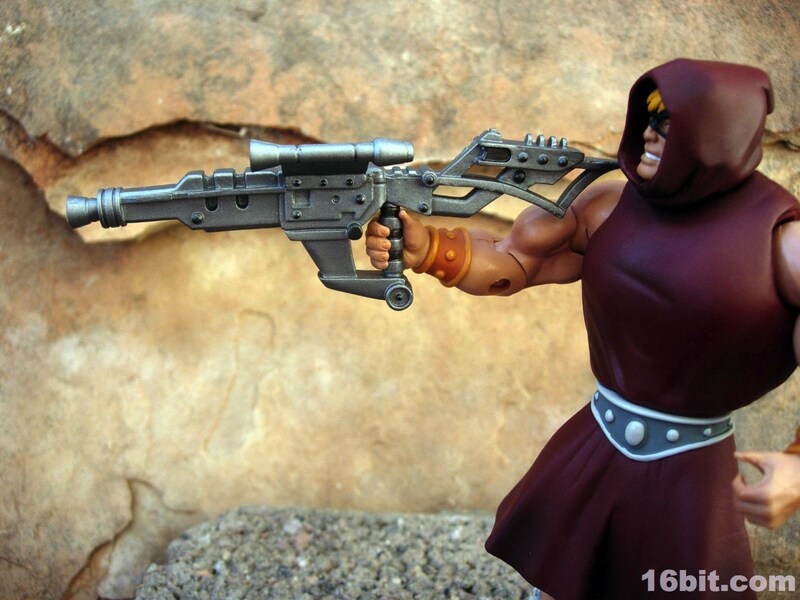 I've heard people say it's unpainted, but that's not quite true-- the silver weapon seems to be covered in paint, plus there are some dark grey rivets and a few other painted elements on the grip. 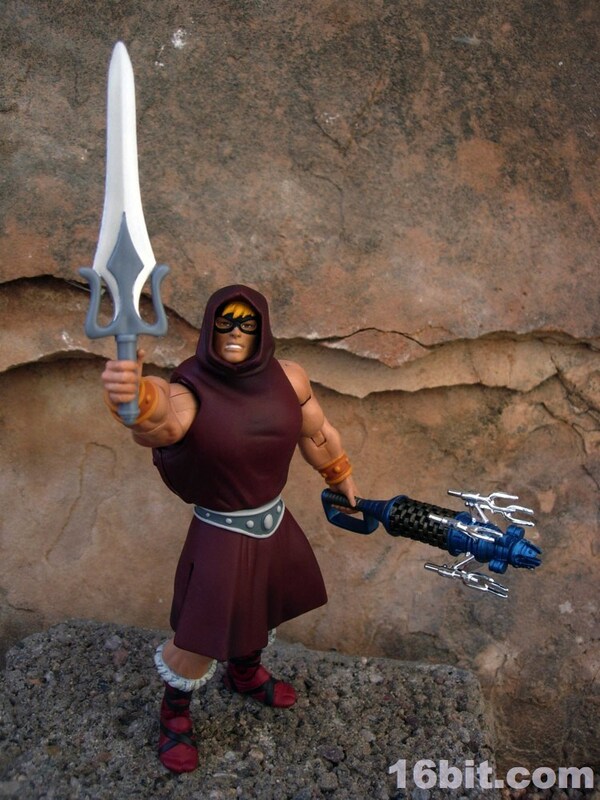 This weapon is similar to the one which the Powers of Grayskull Bionatops included in the 1980s, and with any luck we'll see this again with an actual green cybernetic triceratops between now and when the line becomes unprofitable. 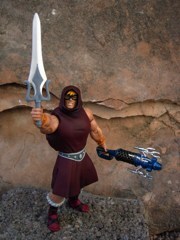 The final accessory in the set is a more-or-less standard issue silver and grey Power Sword, because it's He-Man, and He-Man needs a sword like Luke Skywalker needs a Lightsaber.